Famous film actor and Rajya Sabha Member Hemamalini canvassed for BJP candidate C.P.Yogeshwar at "toy city" Channapatna in Karnataka on 6th April 2011 along with Chief Minister B.S.Yediyurappa. Bye-election for Channapatna Assembly Constituency is scheduled on 9th April. Hemamalini is known in this part as Basanti, the female lead character of Sholay. Sholay the box office hit three decades ago was entirely shot in Ramagiri Hills at Ramanagaram. Channapatna is just 11 kms away from Ramanagaram on Bangalore-Mysore Highway. On way to Channapatna from Bangalore, Hemamalini had a chance to look upon the Ramagiri Hills. Hemamalini started her election campaign with greeting the public in Kannada. In her speech Hemamalini recalled many memorable instances during the filming of the mega hit film Sholay. 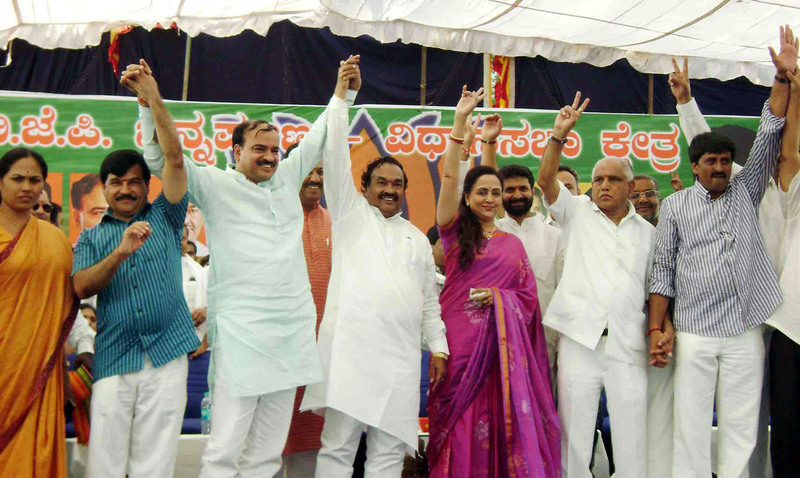 State BJP leaders Ananth Kumar, Shobha Karandlaje, Eshwarappa, Bacche Gowda, C.T.Ravi, V.Somanna, candidate C.P.Yogeshwar accompanied Hemamalini during the campaign.